As in a number of other great quartets for male voices, the key is D major, a tonality which for reasons of vocal range usually signals top As and Bs for the first tenor. In this respect the setting does not disappoint. 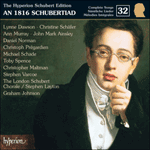 This song offers a feast of the light and heady singing in running semiquavers which must have been possible for only a few young male singers of the Schubert circle. Nearly two centuries later this exclusivity has not changed. The top line of this music is only possible for a handful of today’s young tenors before their naturally high-lying voices become fuller and stronger, as well as less flexible. This is definitely music of youth; as the poet exultantly says: ‘Sieh! Jugendfülle, Schönheitsmeer, Und Wonnetaumel rings umher!’. Age and what some would call the hardening of the vocal arteries undermine a tenor’s ability to undertake this type of filigree work in the giddy heights of voix mixte. Nothing is worse than the loud and laboured efforts of a singer attempting this faery music in full voice; even the use of falsetto, otherwise technically suspect, makes better sense in ensemble music of this kind. It is certain that in writing this gentle hocketing, Schubert did not envisage a mature tenor singing these high notes from the chest with the force of an Rossini operatic aria. The music, the majority of it written in a piano dynamic, suggests not only shimmering water music and the whispering of leafy groves, but the effect that all this beauty has on the rapturous poet, here embodied in four voices intertwined and glancing off each other in tiny details of playful imitation and echo (especially between the top and bottom lines at moments like ‘Ich blicke her’ and ‘Nur Tand sind Pracht’). In the first and second verses the composer repeats the poet’s last line. The third verse is repeated entirely, the key phrase in the last line (‘Natur, in deinem Heiligtum’) rising to a forte dynamic on both occasions. At the repeat we hear this phrase in augmentation where those weaving semiquavers, notable for their dazzling profusion, cease at last and give way to a triumphant march in dotted rhythm. The section ends as ‘in deinem Heiligtum’ is heard for the last time in crotchet chords which veer between Schubert’s magical worlds of A major and minor. The poem’s first three strophes undoubtedly inspire the best music. Matthisson’s fourth verse (beginning ‘Des Himmels Ahnung den umweht’) is repeated and reworked as the entire inspiration for the second section of some forty bars, marked ‘Etwas geschwind’. This is something of a disappointment at first: rather hearty music, with a touch of the drinking-song about it, and a rum-ti-tum accompaniment. This regularly happens in Schubert’s four-part choruses. There are wonderful, atmospheric beginnings to satisfy the poetic side of the male singer; and then a peroration in triple time to appeal to the hearty and the laddish. But even while catering for the popular side of the quartet market, Schubert relieves our disappointment by artfully passing the melody between the tenors and basses antiphonally, by finding a way of setting ‘Des Himmels Ahnung’ (for the third time) in inspired dramatic augmentation, and by reintroducing those wonderful vocal flights of fancy for the lead tenor on the song’s last page. The only high B occurs four bars from the end, reaching suitably heavenwards on the final ‘Wird er zum Himmel selbst entzückt’. A beautiful and thoroughly Schubertian touch is the further repeat of ‘zum Himmel, zum Himmel’ where ‘entzückt’, the verb at the end of the poet’s line, is dropped in favour of an elongated setting of ‘Himmel’ which makes its gentle descent through the D major aether. This quartet has few equals for its depiction of a shared communal joy in natural surroundings where, in the first section, words tumble out almost quicker than the thoughts behind them. All of this suggests the state of being drunk on nature; the vocal line rises, and with it the sap of springtime excitement. Amorous activity remains a constant across the centuries, but here the mood is one of wonder and rapture in nature, infinitely less a part of our century than Matthisson’s. One has the feeling that Schubert’s generation understood the truth of these words and was witness to beauties of the countryside (‘Natur, in deinem Heiligtum’) which, in our own polluted century, can no longer be experienced in the same way. The solo version of the song, D188 (1815), is very different. This smooth and flowing song in barcarolle mood is much more contemplative. What is praiseworthy about the version for male quartet is that its mood and momentum are especially tailored to the choral medium; it is not simply an expanded version of the solo lied. The piano part, however, is little more than an efficient, if discreet (and just occasionally inventive) doubling of the vocal lines. It comes as no surprise to see that the first sketch shows a quartet without accompaniment. 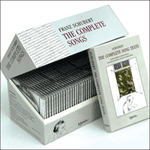 This is not one of the works, like Gondelfahrer (D809), where the accompaniment has a life of its own. Schubert was asked by the publisher Diabelli to supply a piano part in February 1823, and he seems to have complied only because pressed to do so. A further mystery questions the dating of the piece. The first Deutsch catalogue follows the dating of the manuscript in the Witteczek-Spaun collection, but Deutsch 2 dates the work later, using the composer’s handwriting as a criterion. From the musical point of view, however, there is nothing about this song which makes 1816 an impossible date: for the purposes of this disc we, like Otto Erich Deutsch, have taken it to be a work from that year. Wird er zum Himmel selbst entzückt. and teeming joys lie all around. and my soul soars ever higher. will know the delight of heaven itself!